Who Was Buying Iranian Oil And What Happens Next? With Trump having started the 6 month process of pulling out from the Iranian nuclear deal (or rather as Steven Mnuchin admitted, Trump's true intention is merely renegotiating the existing deal and "entering a new agreement") the biggest concern among traders and analysts is what impact the Trump decision will have on Iran's oil exports. As a reminder, some such as Barclays have suggested that Iran's oil production may not be affected at all; others such as UBS predict the sanctions could lead to the reduction of oil exports by 200-500kb/d over the next 6 months. Meanwhile, Deutsche Bank notes that because of the 180-day wind down period, neither Iranian oil production nor exports will drop before the 5 November 2018 effective date. In fact, if behavior follows the example from 2012, there is the possibility of a short spike in Iranian exports just before the effective date, after which a slow decline may set in. 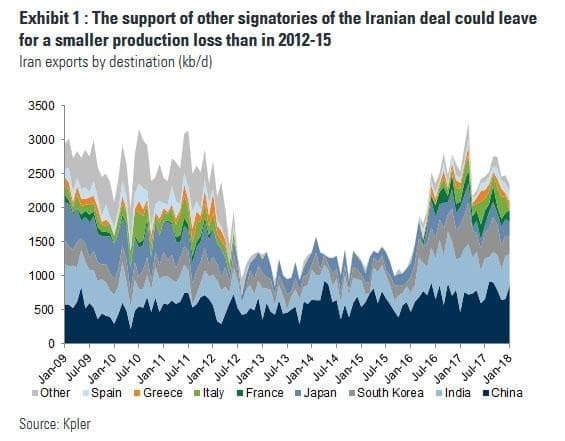 So with the support of the other deal signatories in place, Goldman's Damien Courvalin writes that the impact on Iranian production may be more limited than implied by the US secondary sanctions, and certainly less than the 1mmb/d decline seen in 2012-15 which many use a benchmark for what happens next. 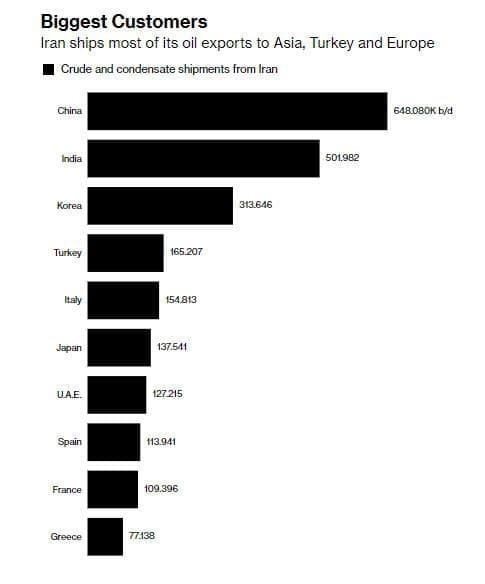 After all, as shown in the chart below, the bulk of Iranian exports is shipped to Asian countries - most of whom have already said they will continue importing Iranian oil - while the handful of European nations that received Iran crude will likely continue to do so in the future, once they request, and are granted, sanctions waivers. For Iran's clients, what happens this time will likely echo the last episode earlier this decade, when Iran was also sanctioned by the U.S. Back then countries were given exemptions by the U.S. - reviewed every 180 days - if they “significantly” reduced imports from the Islamic Republic. While a specific quantity of reductions that would make buyers eligible for waivers wasn’t announced, a slew of nations including China, India and South Korea received them. Overnight, Japan became the first country to confirm that it will seek a waiver. The nation plans to find out whether its current import volume is enough to get an exception or whether it needs to further reduce purchases, Bloomberg reported. Meanwhile, nations such as China, India and Turkey will most likely oppose outright the U.S. move and keep current levels of Iranian crude purchases; still some smaller U.S. allies including South Korea may comply, unless they get a waiver, over concerns of they could lose a security umbrella against North Korea, according to MUFG Bank. Separately, and in another deja vu to the last Iran sanctions, in order to skirt the U.S. financial system, Asian buyers could also resort to using currencies other than the dollar to pay Iran for their oil purchases. Payments may be routed through either local or foreign banks that don’t have close ties to America. First, the US could release SPR barrels to help compensate for lost Iranian production, with Iran demand also set to decline due to the sanctions. Second, Section 1245 of the National Defense Authorization Act for Fiscal Year 2012, which governs the implementation of oil sanctions on Iran, specifies that their implementation requires an assessment as to "whether the price and supply of petroleum and petroleum products produced in countries other than Iran is sufficient to permit purchasers to reduce significantly in volume their purchases from Iran". Our outlook for a tight oil market in 2H18-1H19 could therefore leave the magnitude of the required Iran import reductions below the 20% targeted in 2012. Medium term, we would expect to see a greater shale supply response to high oil prices, especially once pipeline bottlenecks in the Permian ease (2H19). That said, there are clear upside risks to the oil prices, among which the hawkish tone of President Trump, the re-introduction of all the past secondary sanctions, the guidance to begin implementation immediately and finally, the high efficiency exhibited by the latest round of US unilateral sanctions on Rusal all raise the risk that Iranian production declines sharply even despite this foreign support. Importantly, it is unlikely that a sharp decline in Iranian exports translates into a commensurate decline in global supplies. The US Treasury Secretary commented that the US has had conversations with various parties that would be willing to increase oil supplies to offset Iranian losses. In particular, Saudi Arabia's energy ministry issued a statement saying that the country was committed to supporting the stability of the oil market after the US decision to withdraw and that the Kingdom would work with major producers and consumers with and outside OPEC to curb the effects of any supply shortages (also helping limit the offsetting beneficial impact of higher oil prices for Iran in our view). Saudi Arabia had already boosted its oil output during the last round of sanctions. Admittedly, there is no guarantee that Saudi Arabia would deliver a perfect offset to lost Iranian volumes, especially given its assessment that the rebalancing of the oil market is not yet achieved. And even if Saudi Arabia did match Iran's production losses, it would simply reduce an already relatively low level of production spare capacity. Curiously, the biggest risk for an upside price spike has little to do with Iran, and everything to do other potential supply choke points: growing geopolitical tension in other key oil producing countries like Saudi Arabia, Venezuela, Libya and Nigeria create risks of additional production losses in the face of depleted inventory buffers, according to Courvalin. For example, yesterday also saw a military confrontation between Israel, Syria and Iran. The situation in Venezuela has already led to a 600 kb/d decline in production over the past six months (more barrels than presently at risk in Iran), with no sign of any slowdown in production declines. In fact, the seizure of Venezuelan assets this week has led to a stall in local exports. US sanctions on Iran will hardly impact on Iranian crude oil production and exports. Moreover, their impact on global oil supplies and prices will hardly be noticeable. Three cardinal factors lie behind my assessment. One, contrary to analysts’ and bank’s projections, Iran will not lose a single barrel of oil exports. More than 75% of Iran’s oil exports go to China and the Asia-Pacific region while the remaining 25% go mostly to the European Union (EU). China, India and other Asia-Pacific region countries as well as the EU are not going to comply with US sanctions and reduce their imports of Iranian crude. While main buyers of Iranian crude will continue to do so, Japan, South Korea and a few others might decide to comply with US sanctions and shun Iranian crude. However, this will be more than offset by increased imports of Iranian oil by China, India and other Asia-Pacific countries as well as the EU. Second, the pre-Iran nuclear deal’s sanctions worked against Iran’s oil exports because of a combination of the EU’s sanctions on global insurance companies insuring Iranian oil cargoes and US sanctions on banking making it difficult for Iran to receive payments for its oil imports in petrodollar. The EU is not going to walk away from the Iran nuclear deal and therefore it will not be imposing any sanctions on Iran thus further weakening US sanctions. Third, Iran will be using the petro-yuan for payment for its oil exports thus bypassing the petrodollar altogether and nullifying the impact of the sanctions. And while Saudi Arabia would welcome the opportunity to boost production to offset a so-called decline by Iranian oil exports, other OPEC and non-OPEC members such as Iraq and Russia respectively would like also to share in this benefit. In such a hypothetical situation, Saudi Arabia would have to balance the benefits from increased production against a collapse of the OPEC/non-OPEC production cut agreement. The agreement buoyed by positive oil market fundamentals has pushed up oil prices to $77 a barrel today. A collapse of the agreement risks bringing back glut to the market with very adverse repercussions for the Saudi economy which suffered most from the 2014 oil price crash and economies of the OPEC members. Furthermore, if claims by the EIA about rising US oil production are true, then the US can offset a so-called decline in Iranian exports without Saudi Arabia risking the collapse of the OPEC/non-OPEC agreement. On balance, I believe Saudi Arabia will not risk the collapse of the production agreement for a short-term benefit just to score points against Iran despite the escalating tensions between them.